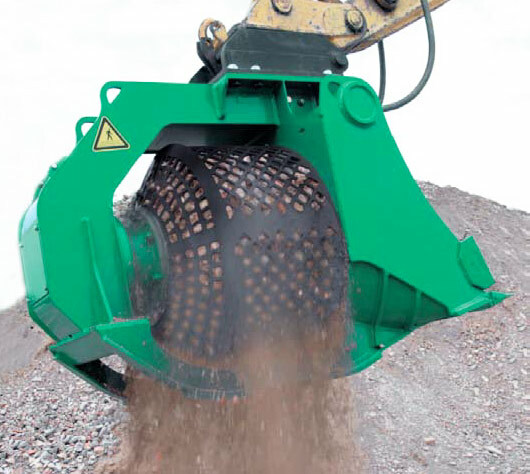 The “SR” Rotary Screening Bucket (5 models) has different applications in screening natural material, such as river beds, quarry residues, sand and dry soil, as well as in every situation where fine screening is required. This bucket stands out for the frame’s sturdiness and for its reliability, built to resist to the most heavy duty workloads. An Epicyclic gear motor directly drives the rotation of the screening grilled basket. The screening grill is extremely sturdy and features a conical base that optimizes the material handling both when the blade is parallel to the ground or when its position angle is more closed. The single piece grill basket can be easily removed and replaced for different screening sizes (from 20x20mm to 100x100mm).